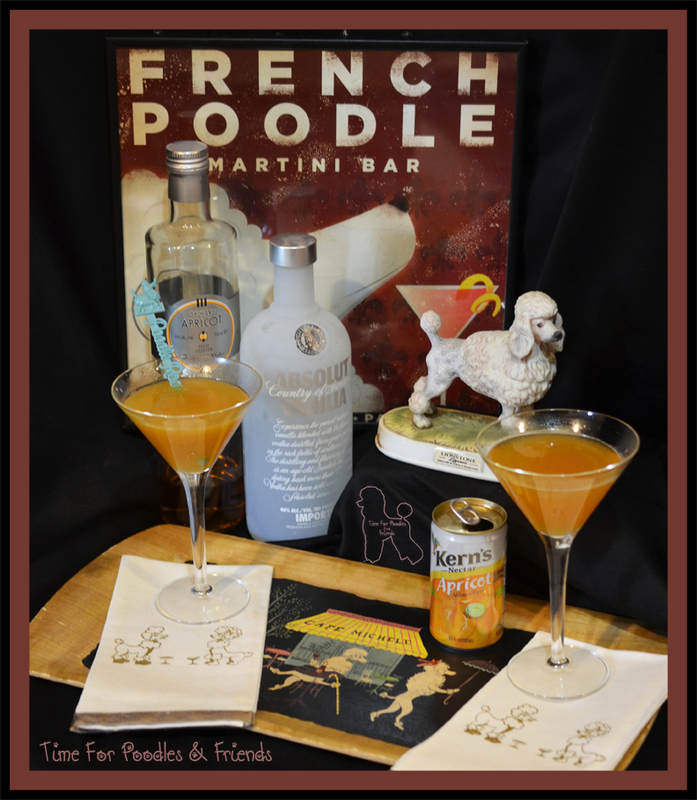 Time For Poodles And Friends: The French Poodle Martini Bar Is Open-Time For The Apricot Poodle! 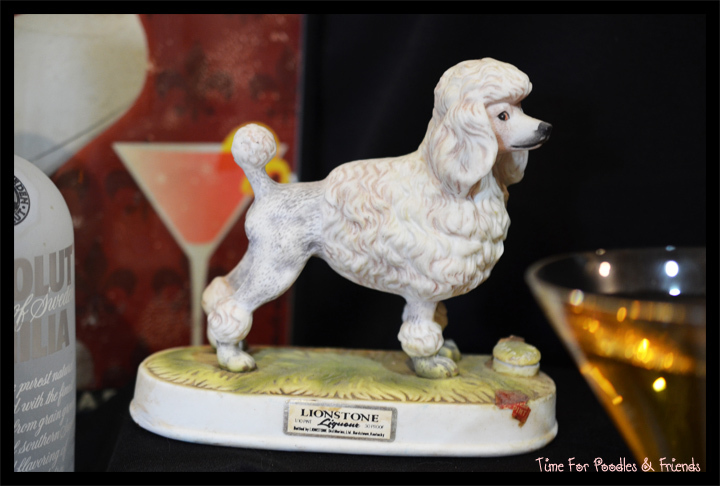 The French Poodle Martini Bar Is Open-Time For The Apricot Poodle! We've been enjoying The Apricot Poodle for a few months but it always takes me forever to get together the photo-shoot for my drinks. My aim for cocktails is that they are simple and delicious and think this one fits to bill. 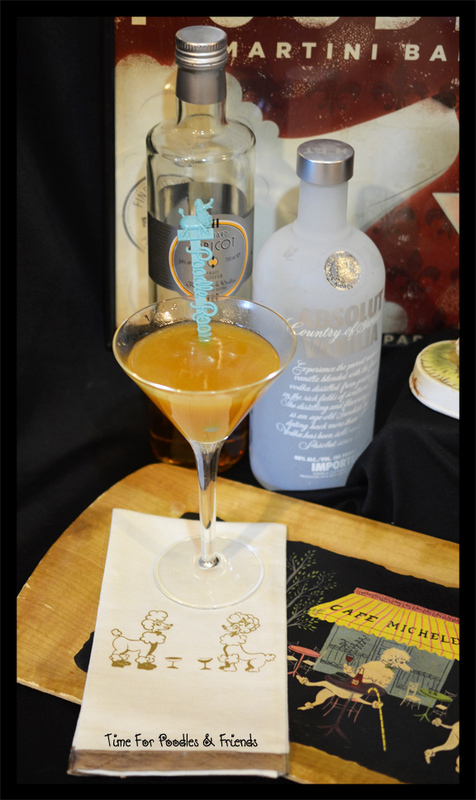 But the key to the deliciousness of The Apricot is the quality of the Apricot liqueur. I first was using some I had on hand which was a cheaper bottle and was so discouraged by the results. I made a trip to Lucas Liquor on a hunt and I found the Orchard liqueurs from Austria's Rothman and Winter. One of them was Apricot. It runs around $20 but is so smooth. It would be delicious in deserts too. Chill one martini glass (of course, this is optional....but I like to). And now to the vintage. Just a few close ups. 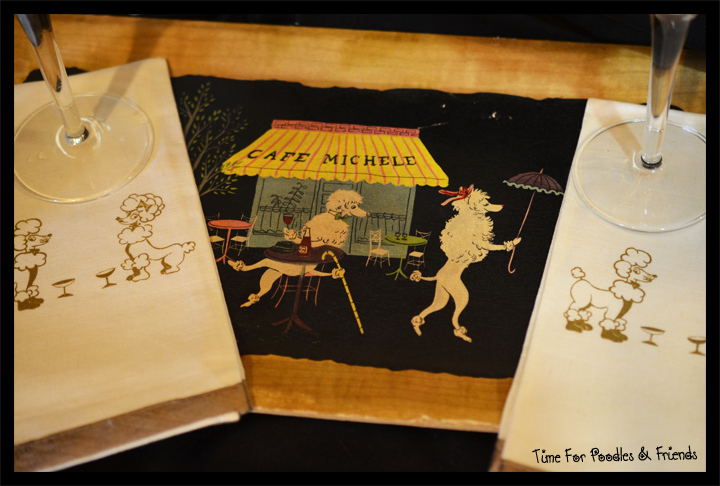 My one Poodle Room swizzle stick with some vintage white and gold cloth napkins I picked up on eBay. Yes, this is a decanter. And a big shout out to Rukus The Eskie, Owned By A Huskie, M.K. Clinton for hosting us. That is so cute! Now you make me want to work on a Chocolate Lab bar!! Go for it! It is a fun thing to play with. I bet you could find a Lab Martini Bar poster.